A pleasure and an honor to be awarded at the PX3 – Gran Prix de Photographie, Paris 2015. The same exhibition was helded in Chang Mai this February. Unfortunately I could not be present at the exhibitions, so the photos I managed to get don’t show my image in detail but the entire exhibition. I have included my photo here below. PX3 Curators Challenge winning images Exhibition 2014. My photograph titled “Western Beauty In Nairobi’s Hell” is the one in front of the man with the pink shirt. Exterior of the Rooftop gallery in the trendy area of Bangkok. 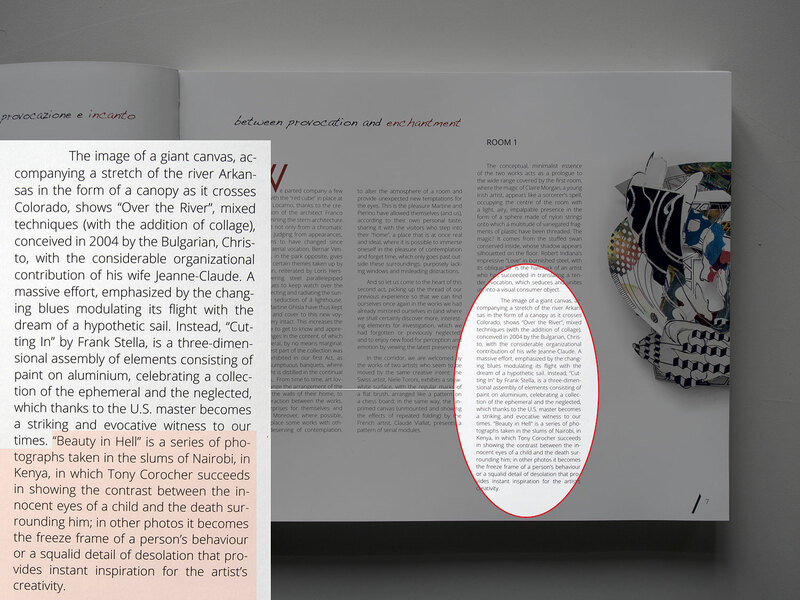 “Beauty In Hell” published in the 2015 CATALOG of the GHISLA ART COLLECTION (Museum of Modern & Contemporary Art). I’m extremely happy to announce that 2 “Beauty in Hell” photographs (in their unique copies, 100x70cm) have been included in the 2015 permanent exhibition at the Fondazione Ghisla Art Collection (Museum of Modern & Contemporary Art, Locarno, Switzerland) and have been published in the 2015 Catalog that will be distributed internationally … what a fantastic start to the year 2015. Here below some pictures of the catalog and the full list of the artists for 2015. 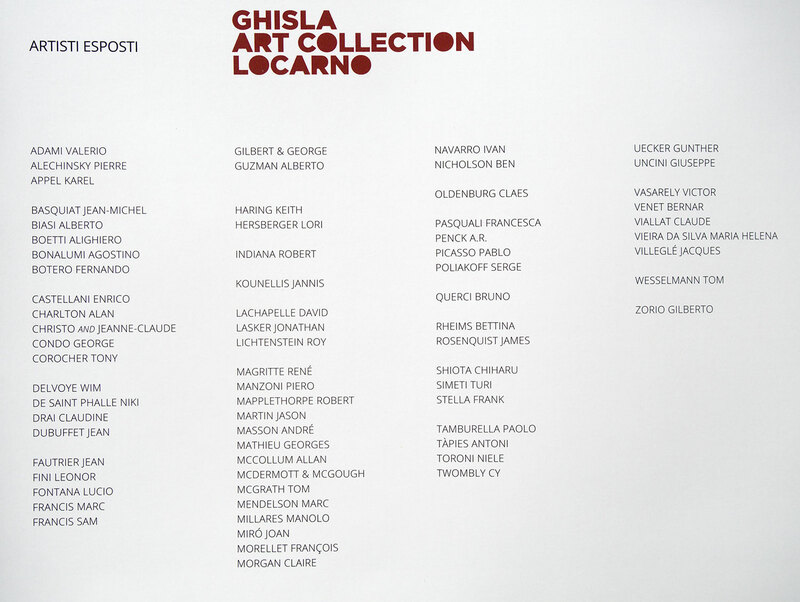 A deeply felt thank you to the Fondazione Ghisla for their appreciation of my work and for a fantastic opportunity! PS. I would like to take this opportunity to clarify that there has been an honest mistake in my Biography at the end of the catalog. Unfortunately when the catalog was designed and printed I was not reachable (because up in the mountains in Vietnam) and did not know until today about it. In the Biography it is written that “a solo exhibition of his was hosted by The Venice Biennale at the Bangladesh Pavilion”… this is not correct. Yes, a solo exhibition was hosted by the Bangladesh Pavilion but only in conjunction with The Venice Biennale and not as officially part of the Biennale. It is important for me to make this clear. Thank you. 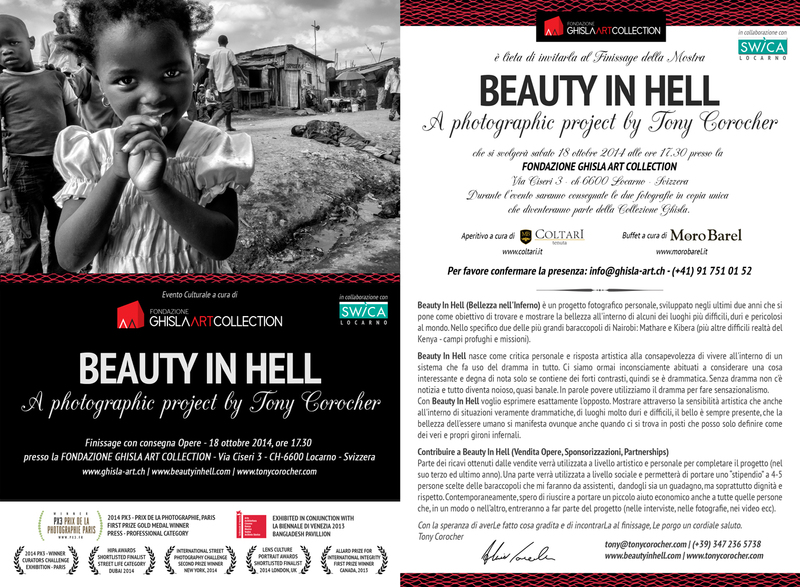 Crowdfunding Campaign by Tony Corocher: Beauty In Hell is an award winning, independent reportage and a personal photographic dream created to find and document the beauty present in some of the most difficult, poverty stricken and dangerous realities around the world. Hi, My name is Tony Corocher and I am a documentary and fine art photographer. This is my personal Crowdfunding Campaign. BEAUTY IN HELL is a critical and personal artistic response to an increased awareness of living in a system that uses drama everywhere. I believe we are now unconsciously accustomed to consider an event interesting and noteworthy only if it contains some form of strong contrast, therefore if it is dramatic. Without drama there is no news and everything becomes boring, dull and almost unworthy of our attention… we use drama to create sensationalism. But Drama is just one part of the story… if drama becomes the only thing mainstream media covers and the only thing we hold up, what can we expect to grow from it? With Beauty In Hell I want to to express, through artistic sensibility, exactly the opposite and show that beauty within the human spirit is always present, in every situation, even in the most difficult and dangerous realities around the world. Clearly any form of beauty in these places is not an easy thing to find. First of all we need to feel it inside ourselves, so that we will then be able to see it in others and find a way to make them willing to show it. It can be seen in the eyes of the local people, in their daily activities, in the smiles with which they welcome you, but also in the rage and aggression with which they approach you… in a few words in the spontaneity, simplicity and lack of malice with which they act. Beauty is clearly visible in the sense of community and sharing that our society has nearly lost or perhaps has simply forgotten. BEAUTY IN HELL was born as a dream, and I’ve spent the last 3 years developing it, injecting all of my passion and experience in to it, and dealing with the associated risks and dangers. In 2011 I started the project by researching and documenting everyday situations in Vietnam, Kenya and Nepal . In 2012-13 I documented beauty inside the frightening realities of the Mathare and Kibera slums (Nairobi, Kenya), of the refugee camps in North Kenya and other hard situations in the Middle East and Asia (more info and a backstage video about Mathare and Kibera Slums at the end of this page). Last year BEAUTY IN HELL received several international awards and was exhibited in venues around the world (more info and a video about the awards and the exhibitions at the end of this page). This recognition has helped me realize that, maybe, we are finally ready to see things from a different perspective … THAT OF BEAUTY! And not just through the lens of drama, which breeds fear, which in turn breeds drama. It has become a vicious circle that needs to be exposed and stopped! Starting next January, and during the course of 2015, I will be documenting the beauty in difficult and dangerous realities across Asia. At the moment the selected stages are in Vietnam, Cambodia, Myamar, Bangladesh, Nepal/Tibet, China/Mongolia. Unfortunately, it is not possible for me to explain exactly where, when and what the exact situations are. As I am sure you will understand, for reasons concerning security, safety and to avoid further risks for both me and my guides, these situations cannot be revealed until they have been fully documented and the work is finished. It is essential that each and every situation develops in a spontaneous, true and natural way… and one of the best ways to do this is to come across them unexpectedly, in order to find the story while you are there, directly from the local people and everyday situations. A lot of diplomacy is required and things can get extremely rough very quickly. Beauty In Hell is an ongoing project, and this is our first IndieGoGo campaign developed to raise the funds needed to produce the new artwork for the BEAUTY IN HELL Photographic Exhibition that will be held in galleries and venues around the world in 2015-16. At present we have received availability from venues in Venice, Milan, Switzerland & Chicago (we will keep you informed of new venues with regular updates). The final Artwork will consist of 150-200 photographs (black&white and color), 30-50 of which will be selected for the Exhibitions and the Photobooks, plus a documentary/backstage video and a downloadable e-book. First of all, we ask you to believe in us and in the Project, as we do. To accomplish the next step, to be able to travel to the locations, document and show you new realities, we now need external support too… YOUR SUPPORT! If you love photography, if you care about independent photojournalism or if you simply appreciate what BEAUTY IN HELL stands for, we hope you will join us in our attempt to show the power of Beauty over drama and sensationalism! Help us recognize that Beauty! that Humanity! and the truth that real people matter! EVERY SINGLE DONATION REALLY COUNTS… EVEN SMALL ONES ARE VITAL! We ask for the support of the press, from photographers, from editors, from educators and schools, from professionals in every field… You are the recommendations we need and count upon! We ask for support from your friends, family and colleagues… You are the backbone of the BEAUTY IN HELL campaign! Contributing to this Crowdfunding Campaign means first of all becoming a part of it, becoming part of a group of people composed of not only the photographer but also the team back at home, by the people (selected on location) who will assist and guide us, by the local folks that necessarily will become part of the project, and by you, the SUPPORTERS, who will ensure its success. Without any one of these elements the project cannot exist. On an artistic and personal level: by helping us develop the new Artwork for the traveling Exhibition. On a social, educational and cultural level: by exposing frequently overlooked realities and bringing awareness to difficult situations around the world. At the same time each Contributor will receive an artistic reward and become a collector too (perks and rewards are explained in one of the following chapters). In fact, the Unique Copy & Limited Edition Prints from last year’s campaign have now become collectors’ items. Join our campaign and help us show that life can be a lot better if we pay more attention to beauty and not just to drama! WE ARE THE ARCHITECTS OF OUR OWN REALITY! TOGETHER WE CAN CHANGE AND REBUILD FROM THE PROSPECTIVE OF BEAUTY AND NOT OF DRAMA! I believe that we can’t ask you for donations if we are not also willing to personally invest in this project. We will put our own money, work, experience, resources, passion and knowledge in to it and will be doing the rest of the work ourselves. The realistic amount needed to cover a project like this and ensure a professional, high quality output, is approximately 50 thousand US$, and of course we hope to reach that figure. A large chunk of this sum has already been covered by us and our work (20,000 US$ for: initial research, editing & post-production, social networks, hosting, website, equipment and more). What we need now is to raise at least a further 30 thousand US$ within the first days of February 2015 in order to pay for flights/travel, living costs, documents, visas, local guides, medical/safety requirements and insurance for 2 people, plus the live costs of production on location, registration to the international awards and setup/logistics of the photographic Exhibition (which will travel to various countries). IMPORTANT: This budget does not include any compensation for us. All donations will be used only to finance, support and complete the project. Once on the Paypal page you can contribute either by using your Paypal account or your Credit Card. THE ENTIRE PROCESS IS PROTECTED, VERY SAFE AND EXTREMELY FAST. INDIEGOGO is TRUSTe Certified, and have been an accredited member of the Better Business Bureau (BBB) since 2012. FIRST 10,000 US$ EXTRA – to cover the cost for the design, editing and printing of the official Photobook/Catalogue of the 2015 Exhibition. ANY OTHER EXTRA FUNDS – to cover the cost for research, preparation and setup of next year’s campaign… we are thinking about Central and South America for 2016-2017. BY MAKING SOME NOISE ABOUT THE CAMPAIGN! Get the word out and make some noise about our Beauty In Hell campaign. Convince a friend to get involved and support us with a donation… even a very small one. Share the video, the campaign, the website (www.beautyinhell.com), the Facebook page (https://www.facebook.com/BeautyInHell) with friends, family, colleagues, and every other contact you may have. This is of the utmost importance!!! Help us make Beauty In Hell recognized globally. BY CONNECTING AND REPORTING TO US! Your help in providing us with research, information and direct contacts on location is extremely important… especially when relevant to difficult/hard situations you are familiar with and that we may be able to document. We have great PERKS and INCENTIVES for you… one or more for each contribution. From the official Beauty In Hell 2015 pins/magnets, to tickets to the opening of the Exhibition, to photographic e-books, to signed high quality Collectors’ Photobooks, to photographic workshops personalized to your needs with myself as tutor, to very Limited Edition and Unique Copies Fine Art Collectors’ Prints, and lots more. A full and detailed list of the Perks is available on the right side of this page. THE TEAM – The team behind BEAUTY IN HELL is composed by a few very special individuals. People with professional backgrounds in different fields who believed in me and in the project from the very start. These individuals, also personal friends of mine, have sustained me in many different ways and helped develop the project over the years. Giving up the safety and comfort of my home to go into these difficult situations is not an easy task and the risks involved are quite high. But when I look back at the work produced in the last 2-3 years in Africa (www.beautyinhell.com) and the recognitions obtained, I know that what we can bring back and what we’ll be able to show you is well worth the risks and sacrifices, and maybe, will help us understand a bit more of what is going wrong in our modern society. What are Mathare and Kibera? They are huge slums inside Nairobi, a city with 4.5 million people of which nearly 3 are crammed in to 12 huge slums. These are places where it is not only difficult to enter, but it is extremely risky to move around and get any kind of documentation. Places where you come in contact with unimaginable, shocking and sometimes incredible situations, but also where a sense of community and solidarity gives these people the strength to carry on day by day. Places where a quality of life that we would normally consider extremely low is already a luxury, which very few residents can afford. Places where there is little or no running water and where the cumulative sewage of hundreds of thousand of people flows through open ditches. Places where the quality of life is well below the poverty line and the human conditions are much, much worst than I could ever describe in words. I am talking about a slow and systematic destruction of the basic human rights and dignity that still continues today. After exploring these slums for the past 2 years I can confirm that there is little or no help at all (except for some coalition of poor Catholic charities and some small international organizations). Real, professional and credible documentation of this plight is nearly non-existent and very hard to find. Corruption, abuse and other violent crimes happen on a regular basis. Beauty In Hell è un reportage indipendente, vincitore di diversi premi internazionali e, allo stesso tempo, un sogno fotografico personale sviluppato negli anni con l’obiettivo di trovare e documentare la bellezza presente in alcune delle realtà più difficili, povere e pericolose al mondo. Mi chiamo Tony Corocher e sono un fotografo documentarista e fine art. BEAUTY IN HELL nasce come critica personale e risposta artistica alla consapevolezza di vivere all’interno di un sistema che fa uso del dramma in tutto. Noi ormai ci siamo inconsciamente abituati a considerare una cosa interessante e degna di nota solo se contiene dei forti contrasti, quindi se è drammatica. Senza dramma non c’è notizia e tutto diventa noioso… utilizziamo il dramma per fare sensazionalismo. Ma il dramma è solo una parte della storia…. se il dramma diventa la sola cosa che i media ci trasmettono e quindi la sola cosa a cui facciamo riferimento, che cosa possiamo aspettarci di diverso dal prossimo futuro? Con “BEAUTY IN HELL” voglio esprimere, attraverso la sensibilità artistica, esattamente l’opposto e mostrare che la bellezza dentro lo spirito umano è sempre presente, in ogni situazione, anche quando le condizioni sono veramente drammatiche e i luoghi molto duri e difficili. Chiaramente la bellezza in questi luoghi non è facile da trovare. Bisogna prima di tutto averla dentro di sé per essere in grado di vederla e per fare in modo che la gente sia disposta a fartela vedere. La bellezza si vede negli sguardi di queste persone, nelle situazioni quotidiane, nei sorrisi con cui ti accolgono, ma anche nella rabbia e aggressività con cui ti vengono incontro … in parole povere nella spontaneità, semplicità e mancanza di malizia con cui agiscono. Il bello è chiaramente visibile nel senso di comunità e condivisione che la nostra società ha quasi perso o di cui, forse, si è semplicemente dimenticata nella sua folle ricerca della gioia materiale. BEAUTY IN HELL è nato come sogno personale 3 anni fa… è stato sviluppato, finanziato e portato in mostra con le mie forze iniettandoci tutta la mia passione e la mia esperienza, e affrontando i rischi e pericoli correlati (e anche con l’aiuto in vari campi di alcune persone a me vicine in diversi paesi). Nel 2011 ho iniziato il progetto svolgendo ricerche e raccogliendo documentazione in Vietnam, Kenya e Nepal. In 2012-13 ho documentato la bellezza dentro le spaventose realtà delle baraccopoli di Mathare e Kibera (Nairobi, Kenya), i campi profughi nel Nord del Kenya ed altri luoghi molto duri in Medio Oriente ed Asia (più informazioni a riguardo ed un video del backstage nelle prossime pagine). L’anno scorso BEAUTY IN HELL ha ricevuto diversi premi internazionali ed è stato esposto in diverse sedi in giro per il mondo. (più informazioni ed un video a riguardo nelle prossime pagine). Questi importanti ed inaspettati riconoscimenti mi hanno aiutato a capire che, forse, siamo finalmente pronti a vedere quello che succede sotto una luce diversa… QUELLA DELLA BELLEZZA! non solo attraverso il dramma che produce paura che produce dramma. E’ diventato un circolo vizioso che deve essere esposto e fermato! A cominciare dal prossimo gennaio, e nel corso del 2015, cercherò di documentare la bellezza in realtà difficili e pericolose all’interno dell’Asia. Al momento le tappe previste sono Vietnam (dove arriverò il 5 gennaio), Cambodia, Myamar, Bangladesh, Nepal/Tibet, China/Mongolia… ma sono probabili variazioni durante il percorso. Sfortunatamente non mi è possibile spiegare con precisione dove, quando e quali saranno nello specifico i luoghi e le situazioni che incontrerò. Per ragioni legate alla sicurezza, protezione e per evitare ulteriori rischi sia a me che alle guide che mi accompagneranno, queste situazioni non possono essere svelate almeno fino a quando non sono state documentate ed il lavoro completato. E’ essenziale che ogni situazione si sviluppi in modo spontaneo, vero e naturale, e uno dei modi migliori per farlo è di trovarsi lì inaspettati, quasi per caso, così da trovare la le immagini e le storie direttamente dalla gente locale. L’Artwork finale sarà composto da un set di 150-200 fotografie (bianco/nero e a colori) di cui 30-50 saranno selezionate per la Mostra e i Fotolibri, più un video/documentario del backstage e un e-book scaricabile online. Prima di tutto vi chiediamo di DI CREDERE IN NOI E NEL PROGETTO. Per portare il Progetto al livello successivo, per raggiungere questi posti, documentare e mostrare nuove realtà, ORA ABBIAMO NECESSARIAMENTE BISOGNO DI SUPPORTO ESTERNO… DEL VOSTRO SUPPORTO! Se amate la fotografia, se vi interessa il fotogiornalismo indipendente o se semplicemente apprezzate quello che BEAUTY IN HELL rappresenta, vi chiedo di unirvi a noi nel tentativo di mostrare la forza della Bellezza sul dramma e sul sensazionalismo! OGNI SINGOLO CONTRIBUTO CONTA VERAMENTE TANTO… E, ANCHE SE PICCOLO, E’ DI FONDAMENTALE IMPORTANZA! Ci serve il supporto della stampa, da parte dei fotografi, degli editori, degli insegnanti e delle scuole, da parte di tutti i professionisti in ogni campo… Voi siete le raccomandazioni di cui abbiamo bisogno e su cui facciamo affidamento! Ci serve il supporto da parte dei vostri amici, della vostra famiglia e dei vostri colleghi… Voi siete la spina dorsale della campagna BEAUTY IN HELL. Contribuire a questo progetto significa prima di tutto esserne parte integrante, diventare parte di un gruppo formato non solo dal fotografo, ma anche da un team di lavoro, dagli assistenti, dalle guide, dalla gente locale che entrerà per forza nel progetto e da voi, SOSTENITORI, che ne permetterete la sua realizzazione. Senza una o l’altra di queste parti il progetto non può esistere. quello artistico e personale: aiutandoci a sviluppare il nuovo Artwork per la Mostra. quello sociale, educativo e culturale: permettendoci di esporre realtà spesso trascurate, portando così consapevolezza di situazioni dure e difficili nel mondo. Aderite alla nostra campagna ed aiutateci a mostrare che la vita può essere migliore se poniamo maggiore attenzione alla Bellezza e non solamente al dramma! NOI SIAMO GLI ARCHITETTI DELLA NOSTRA REALTA’! INSIEME POSSIAMO CAMBIARE E RICOSTRUIRE PARTENDO DALLA PROSPETTIVA DELLA BELLEZZA E NON DEL DRAMMA! Non credo sia corretto chiedervi contributi e donazioni se noi, per primi, non siamo pronti ad investire sul progetto di tasca nostra. Abbiamo già messo i nostri soldi, molto lavoro, l’esperienza, le risorse, la passione e le conoscenze, e faremo tutto il resto del lavoro con i nostri mezzi. La cifra realistica per coprire un progetto come questo e assicurare un prodotto finale professionale e di alta qualità, è di circa 50.000 US$, e ovviamente coltiviamo la speranza di raggiungere quella cifra. Comunque una grossa parte di questa somma è già stata coperta da noi e dal nostro lavoro (20.000 US$ per: ricerche iniziali, editing & post production, social networks, sito web, hosting, attrezzatura e altro ancora). Quello di cui ora abbiamo bisogno è di raccogliere 30.000 US$ entro gli inizi di febbraio 2015 per riuscire a pagare voli, trasporti, vitto ed alloggio, documenti, visti, guide ed assicurazioni, visite mediche per 2 persone, più coprire i costi di produzione sul posto, di registrazione ai premi internazionali e per preparare/organizzare la Mostra finale (che si sposterà nel corso dell’anno in diversi paesi). IMPORTANTE: Questo budget non comprende nessuna forma di retribuzione economica per noi. Tutte le donazioni verranno utilizzate per finanziare, supportare e completare il progetto. 2. Cliccare su “GO TO PAYPAL” Una volta arrivati sulla pagina Paypal potrete mandare il contributo attraverso il vostro conto Paypal oppure utilizzando la vostra carta di credito. TUTTO IL PROCESSO E’ PROTETTO, MOLTO SICURO E VERAMENTE FACILE. La piattaforma INDIEGOGO è certificata TRUSTe Certified, ed è un membro accreditato del Better Business Bureau (BBB) dal 2012. PRIMI 10,000 US$ EXTRA – per coprire i costi del design, editing e stampa del Libro Fotografico/Catalogo ufficiale della Mostra 2015. ALTRI FONDI EXTRA – per coprire i costi di ricerca, organizzazione e studio della campagna per l’anno seguente (stiamo pensando al Centro e Sud America per il 2016-2017). FACENDO SAPERE A PIU’ GENTE POSSIBILE DI QUESTA CROWDFUNDIN CAMPAIGN! Spargete la voce, fate un po’ di “casino” online riguardo la campagna BEAUTY IN HELL! Convincete un amico/a a supportarci, a fare una donazione… anche piccola. Condividete il video, la campagna, il sito web (www.beautyinhell.com), la pagina Facebook (https://www.facebook.com/BeautyInHell) con amici, famigliari, colleghi e qualsiasi altro contatto avete a disposizione anche e soprattutto in altri paesi. Tutto questo è di grande importanza!!! Aiutateci a far conoscere Beauty In Hell in tutto il mondo! COLLEGANDOVI E FORNENDOCI INFORMAZIONI! L’aiuto che potete dare fornendoci ricerca, informazioni e contatti diretti sul posto è di estrema importanza… specialmente quando collegato a situazioni dure e difficili di vostra conoscenza e che si potrebbero documentare. Abbiamo diversi tipi di RICOMPENSE ed INCENTIVI… uno o più per ogni donazione. Dalle spille/magneti ufficiali BEAUTY IN HELL 2015, ai biglietti per l’apertura della Mostra, ai Libri Fotografici da Collezione firmati, alle stampe Fine Art Museali da Collezione in Copia Unica o in tirature molto limitate tutte di altissima qualità, e altro ancora. CHI SONO – Tony Corocher (Treviso, Italy – 1974) – Fotografo documentarista/Fine Art & Art Director con base in Italy. Ho passato gli ultimi 20 anni muovendomi tra il graphic design e la fotografia lavorando in diversi luoghi in giro per il mondo. IL TEAM – Il Team dietro a BEAUTY IN HELL è composto da pochi individui, ma molto speciali. Persone con un background professionale in campi diversi, che hanno creduto in me e nel progetto fin dall’inizio. Questi individui, che sono anche degli ottimi amici, mi hanno sostenuto in molti modi diversi e mi hanno aiutato a sviluppare il progetto nel corso degli anni. Lasciare la sicurezza e le comodità della mia casa per entrare in queste realtà molto difficili non è un compito facile e i rischi che mi sto prendendo sono abbastanza elevati. Ma quando guardo indietro al lavoro fatto negli ultimi 2-3 anni in Africa (www.beautyinhell.com) so per certo che quello che riuscirò a portare indietro e farvi vedere vale sicuramente i pericoli e, forse, ci aiuterà a capire cosa c’è di così sbagliato nella nostra società moderna. Cosa sono Mathare e Kibera? Sono delle enormi baraccopoli all’interno di Nairobi, una città con 4.5 milioni di abitanti dei quali 3 sono schiacciati all’interno di 12 enormi baraccopoli. Luoghi dove non solo è difficile entrare, ma dove è molto rischioso muoversi ed ottenere qualsiasi tipo di documentazione. Posti in cui si viene a contatto con realtà inimmaginabili, scioccanti e spesso incredibili, ma anche con il senso di comunità e di solidarietà che permette a queste persone di andare avanti giorno per giorno. Luoghi dove un tenore di vita da noi considerato molto basso è già un lusso che pochissimi possono permettersi. Zone in cui l’acqua non arriva e le fogne scorrono a vista intorno alla gente. Dove le case sono baracche di lamiere e pezzi di legno che prendono fuoco a turno ogni settimana. Dove i bambini giocano scalzi sopra metri e metri di spazzatura mentre gli odori e la puzza ti entrano fin nelle ossa e ti permeano l’anima. Posti dove la qualità della vita è ben sotto la linea di povertà e dove le condizioni umane sono molto, molto peggiori di quanto possa e riesca a descrivere con le parole. 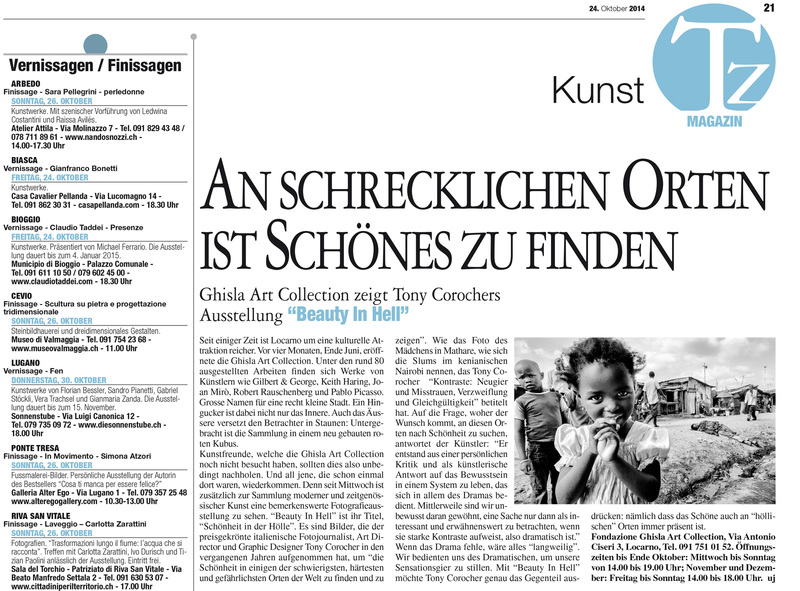 The Finissage of the “Beauty In Hell” Exhibition will be held at Fondazione Ghisla, Museum of Modern & Contemporary Art. Also, 2 photographs in unique copy will be delivered to become part of this incredible international collection. Also, during the Event 2 photographs in their unique copy (a 42×28” Fine Art Giclèe Print) will be handed over to become part of the Ghisla Collection. The 2 images purchase by the Museum are show here below. Contrasts: Curiosity & diffidence, desperation & indifference | Through the streets of Mathare Slum (Nairobi). The contrast between the innocent beauty of the young girl, the vivid diffidence of the boy behind her, the finality of the desperation shown by the man on the ground and the indifference of the people passing by. This is the ensemble of feelings that runs through these slums every day. Africa, where are you going … | A young girl playing on the railway that runs through Kibera (the second largest slum in the world – Nairobi). All you can see in the background is Kibera with over one million people. While I was taking this picture my mind kept thinking about what kind of future awaits the African countries. 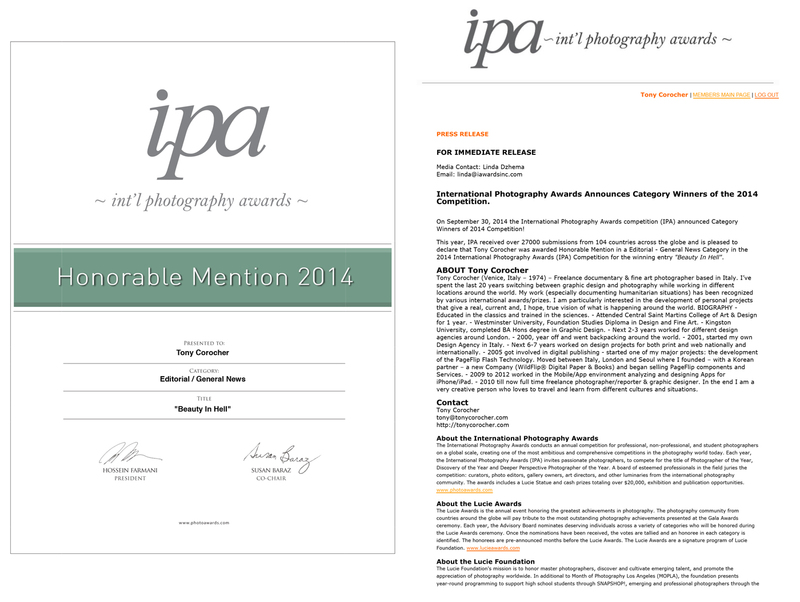 The 2014 IPA (International Photo Awards) have announced the Honorable Mentions from which 1st, 2nd and 3rd places will be selected in each category. – Editorial : General News – Pro Category. IPA AWARDS: The International Photography Awards conducts an annual competition for professional, non-professional, and student photographers on a global scale, creating one of the most ambitious and comprehensive competitions in the photography world today. A real pleasure to be included (after 3 long selections) among the Shortlisted Finalist in this year HIPA Awards 2013/2014 “Creating The Future” – Street Life Category. Here are a couple of images from the book that was published and that I just received. Just INCREDIBLE! part of the “Beauty In Hell” Project to be exhibited at the ARLES FOTO FESTIVAL 2014 and at the Espace Beaurepaire (Paris) as 1 of 40 winning photos of the PX3 – Prix De La Photographie, Curators Challenge Prize. PX3 – Prix De La Photographie, Curators Challenge Prize – The Paris Photography Prize strives to promote the appreciation of photography, to discover emerging talent, and introduce photographers from around the world to the artistic community of Paris. 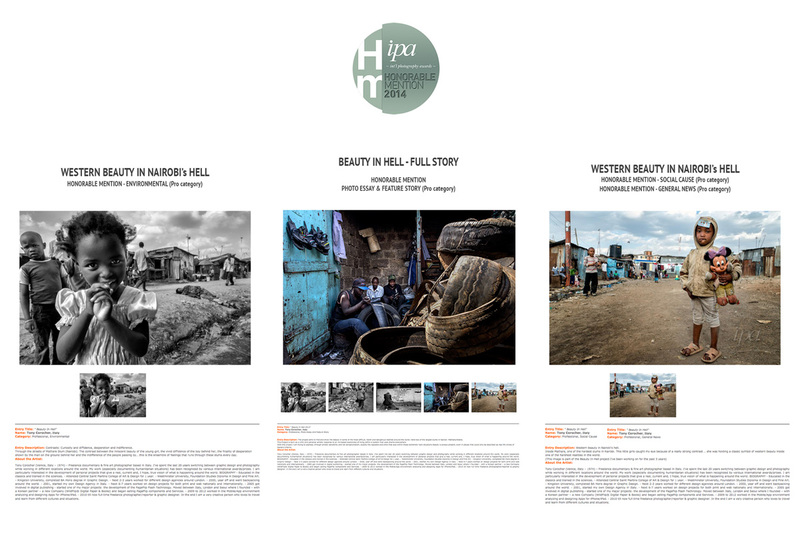 I’m proud to announce that my project BEAUTY IN HELL (Nairobi’s Slums, Kenya 2012-13) has been selected as FIRST PRIZE GOLD MEDAL WINNER AT THE 2014 PX3, GRAND PRIX DE LA PHOTOGRAPHIE PARIS, IN THE PRESS-PROFESSIONAL CATEGORY (www.px3.fr). An international jury of top international decision-makers in the photography industry selected PX3 2014’s winners from thousands of photography entries from over 85 countries. 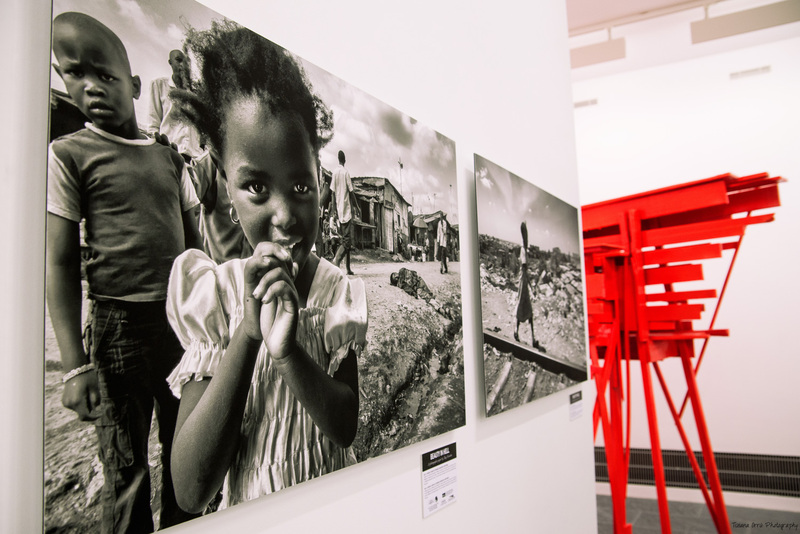 Sono orgoglioso di annunciare che il mio progetto BEAUTY IN HELL (Nairobi’s Slums, Kenya 2012-13) è stato selezionato come PRIMO PREMIO VINCITORE DELLA MEDAGLIA D’ORO AL 2014 PX3, GRAND PRIX DE LA PHOTOGRAPHIE PARIS, NELLA CATEGORIA PRESS-PROFESSIONAL (www.px3.fr). Decine di migliaia di foto spedite da oltre 85 paesi nel mondo sono state analizzate e giudicate da una giuria internazionale di altissimo livello. Tony Corocher of Italy was Awarded: First Prize in category Press for the entry entitled, ” Beauty In Hell 2013 .” The jury selected PX3 2014’s winners from thousands of photography entries from over 85 countries. Contrasts: Curiosity & diffidence, desperation & indifference. Through the streets of Mathare Slum (Nairobi). The contrast between the innocent beauty of the young girl, the vivid diffidence of the boy behind her, the finality of the desperation shown by the man on the ground behind her and the indifference of the people passing by… this is the ensemble of feelings that runs through these slums every day. I ran into this little boy the first day in Mathare Slum (Nairobi). He was going to school. Behind him one of the streets that leads into the slum. Come to church and “the knowledge of God Ministry” will save you from desperation! Welcome to Mathare!!! When I saw this man I immediately pictured him as someone who had seen it all, someone who knew that with or without religion there is no easy way out… Complete, total poverty pushes men to believe, just in order to have a little hope. Right or wrong, it is still a good thing in these desperate situations. Inside Makadare, one of the largest markets/slums in Nairobi. People are working on the production of shoes from old tires and other rubber recycled objects. This is where products are made, where the work is done and, normally, people are not allowed to enter here. This place is like a huge labyrinth of tiny shops and small businesses crammed together. Western beauty in Nairobi’s hell. This little girls caught my eye because of a really strong contrast … she was holding a classic symbol of western beauty inside one of the harshest realities in the world. – the people of Mathare and Kibera Slums (Nairobi) for accepting me and helping me go around. I hope I will be able to come back and bring some more help through Sponsors and my work. – Sister Flora from Flora Hostel in Nairobi and all the staff that works there. You have been an invaluable help during the last 2 years!! – Collins, my assistant and guide inside Mathare and around Nairobi. 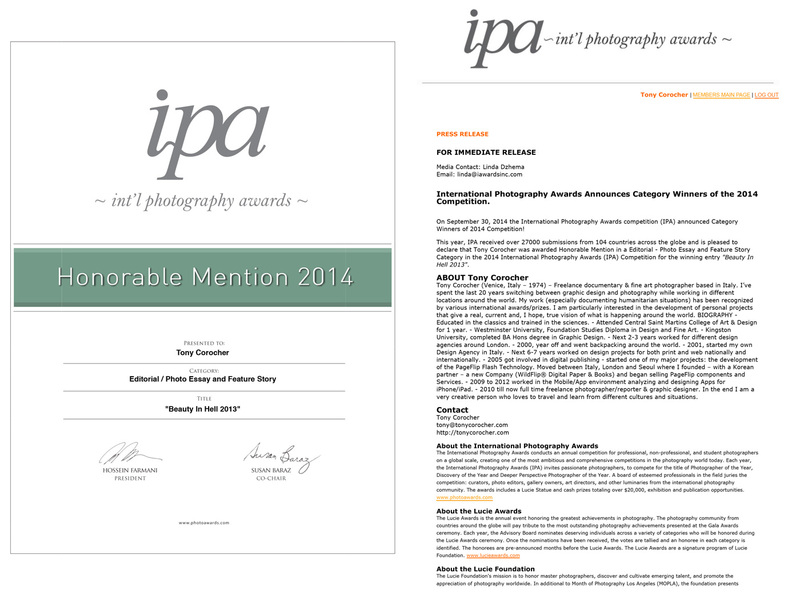 – The PX3 Prix De La Photographie Paris, and its jury for appreciating and selecting my work. – All the people (few, but really good) that supported me and believed in the project during the last 2 years.Thanks to all and let’s try to make it bigger and better this year! The good news keep coming!… After the incredible first place in the 2014 Px3, Grand Prix De La Photographie Paris, Press-Professional Category, my image “Western beauty in Nairoby’s Hell” has been selected as winner of the separate Px3 CURATORS CHALLENGE and will be exhibited in prestigious galleries IN PARIS AND BANGKOK + INTERNATIONAL PUBLICITY. “Western beauty in Nairoby’s Hell” is a TOP 20 selection among thousands of participants: two guest curators one from the US (Bill Hunt, Curator, New York) and one from France (Daphne Angles, New York Times, Paris) chose 20 Photographers work each to present in an exhibition in Paris. This selection is independent of the gold, silver, bronze winners. They will be showcased in the book but not necessarily in the Paris Exhibition.